Exercising with the Blackthorn training rope 30D supports and demands the whole body. Rope training improves stamina, strength, and coordination. Due to different rope thicknesses, beginners as well as athletes have a lot of fun doing rope training ! 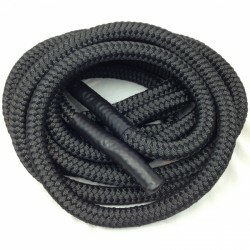 The Battle Ropes of Blackthorn offer incomparable functional training. The training rope – a training device as simple as smart – supports cardio and trains strength and coordination. The training might look easy at first sight, but it demands the whole body, is very effective, and makes a lot of un. Everyone, who has tried training ropes, can testify how much you get exhausted doing rope training ! The training ropes of Blackthorn are lavishly tied. This makes them flexible and much more durable. The training rope is made of 100% of polyester - it is suitable for indoor and outdoor use. The grip zone is double sewed and glued, because this is the zone where strongest loads come up. A long-term training with the Blackthorn training rope 30D is guaranteed. Blackthorn wall mount for training ropes In stock! Blackthorn ring for training ropes In stock!